Apical pulse is auscultated with a stethoscope over the chest where the heart’s mitral valve is best heard. 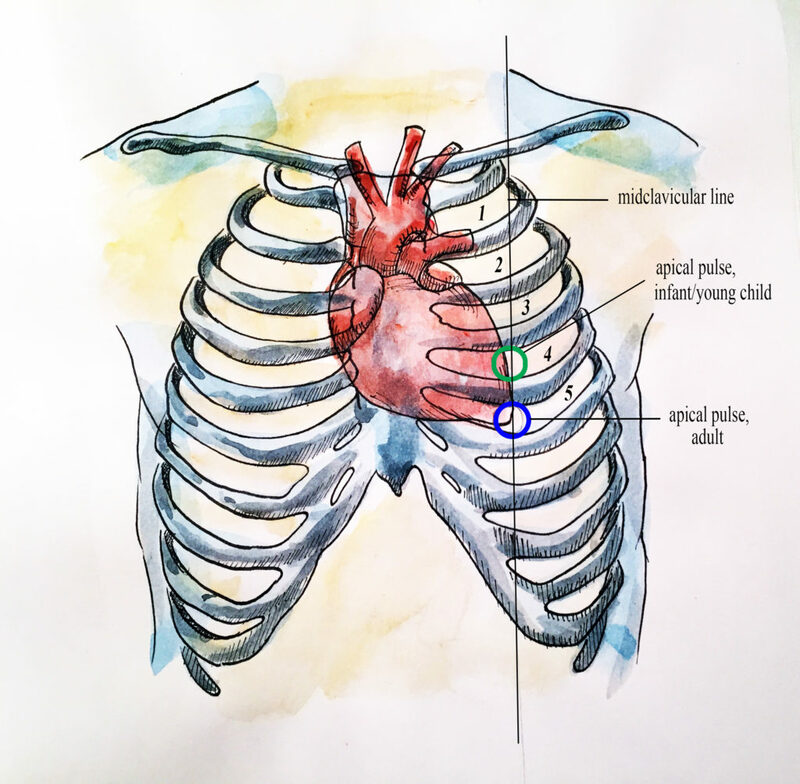 In infants and young children, the apical pulse is located at the fourth intercostal space at the left midclavicular line. In adults, the apical pulse is located at the fifth intercostal space at the left midclavicular line (OER #1). See Figure 3.5 below. Apical pulse rate is indicated during some assessments, such as when conducting a cardiovascular assessment and when a client is taking certain cardiac medications (e.g., digoxin) (OER #1). Sometime the apical pulse is auscultated pre and post medication administration. It is also a best practice to assess apical pulse in infants and children up to five years of age because radial pulses are difficult to palpate and count in this population. It is typical to assess apical pulses in children younger than eighteen, particularly in hospital environments. Apical pulses may also be taken in obese people, because their peripheral pulses are sometimes difficult to palpate. Position the client in a supine (lying flat) or in a seated position. Physically palpate the intercostal spaces to locate the landmark of the apical pulse. Ask the female client to re-position her own breast tissue to auscultate the apical pulse. For example, the client gently shifts the breast laterally so that the apical pulse landmark is exposed. See Figure 3.6 below. Alternatively, the healthcare provider can use the ulnar side of the hand to re-position the breast tissue and auscultate the apical pulse. Ensure draping to protect the client’s privacy. Either the bell or diaphragm are used to auscultate the client’s heart rate and rhythm. There is a pediatric-size stethoscope for infants. Typically, apical pulse rate is taken for a full minute to ensure accuracy; this is particularly important in infants and children due to the possible presence of sinus arrhythmia. Upon auscultating the apical pulse, you will hear the sounds “lub dup” – this counts as one beat. Count the apical pulse for one minute. Note the rate and rhythm. Although pulses are best measured at rest, sometimes this is not possible. It is important to document other factors such as when a person is in pain or an infant/child is crying. Feel the intercostal spaces to accurately locate the apical pulse and obtain a physical landmark. There is a space below the clavicle, but the first intercostal space is located below the first rib. You can also slide your fingers down the manubrium where it meets the sternum: this is called the sternal angle (angle of Louis). The second rib extends out from the sternal angle. Apical Pulse by Ryerson University is licensed under a Creative Commons Attribution 4.0 International License, except where otherwise noted.